Indemnification provisions are among the most highly negotiated and critical deal points in private M&A transactions. In general, the parties provide mutual indemnification to each other for breaches of representations, warranties, and covenants. In practice, indemnification provisions are a tool to allocate the risk of known and unknown liabilities between the buyer and seller. For the nine-month period ending September 30, 2016, data are available for a total of 154 asset purchase transactions involving companies valued at $100 million and higher. Of these, indemnification data were available for 148 transactions, of which 141, or 95%, contained indemnification obligations by the seller. Of the 148 transactions for which data on indemnification were available, 131, or 89%, contained indemnification obligations by the acquirer. Of the 148 transactions for which indemnification data were available, 142, or 96% transactions included indemnification obligations of either party or both parties. The parties to the transaction may agree that indemnification will be the sole and exclusive remedy for any claims arising out of the purchase agreement. Certain claims, such as fraud and knowing or willful misconduct, are typically carved out from the exclusivity, giving the indemnified party the right to pursue other legal or equitable remedies for those claims. Of the 142 asset purchase deals announced between January 1, 2016 and September 30, 2016 with indemnification provisions, 85, or 60%, provided for indemnification as the exclusive remedy. Indemnification packages may include a requirement that claims brought for indemnification exceed a de minimis threshold or minimum claim amount. This threshold prevents acquirers from bringing immaterial claims. Of the 142 asset purchase deals announced between January 1, 2016 and September 30, 2016 with indemnification provisions, 45, or 32%, contained a de minimis threshold or minimum claim amount. Beyond a de minimis claim amount, many deals include a “tipping” basket or a deductible, both of which require that the aggregate amount of all claims exceed a specified dollar threshold before the indemnifying party becomes obligated to compensate the other party for the claims. With a basket, once the threshold is reached, the indemnifying party becomes liable for the full amount of claims. In contrast, with a deductible, once the threshold is reached, the indemnifying party becomes liable for only the amount in excess of the deductible. Of the 142 asset purchase deals announced between January 1, 2016 and September 30, 2016 with indemnification provisions, 43, or 30%, contained a basket. For the deals with a basket, the minimum basket amount expressed as a percentage of the deal value was 0.01%, the maximum basket was 6%, the median was 0.1%, and the mean was 0.55%. Of the 142 asset purchase deals announced between January 1, 2016 and September 30, 2016 with indemnification provisions, 74, or 52%, contained a deductible. For the deals with a deductible, the minimum deductible amount expressed as a percentage of the deal value was 0.06%, the maximum deductible was 10%, the median was 0.67%, and the mean was 0.94%. Most deals contain exceptions to the basket and deductible limitations. While the exceptions may be specific to each deal, so-called “fundamental” representations (e.g., due organization, authorization, capitalization, noncontravention, etc.) and tax and environmental representations may be excluded from the limitations of the basket and deductible. Of 117 transactions with a basket or deductible, 67, or 57%, contained exceptions for certain breaches of representations from the basket or deductible. Indemnifying parties typically impose a limit on the total claims amount that they will indemnify. This limit, or cap, is generally calculated as a percentage of the overall deal price. Of the 142 asset purchase deals announced between January 1, 2016 and September 30, 2016 with indemnification provisions, 126, or 89%, contained a cap. Among the deals with a cap, the minimum cap was 0.06% of the purchase price, the maximum cap was 100% of the purchase price, the median cap was 9% of the purchase price, and the mean was 8.89% of the purchase price. As with baskets and deductibles, indemnity caps may be subject to certain exceptions for specified types of claims, such as fraud, willful misconduct, or breaches of certain representations and warranties. Of the 126 transactions that contained an indemnity cap, 83 transactions, or 66%, included exceptions to the cap. The most common kind of exception was fraud, which appeared in 46 transactions. Note that many transactions contain multiple exceptions to the indemnity cap. Indemnifying parties will also limit their indemnification obligations by imposing a time period during which the other party may bring a claim for indemnification for a breach of a representation or warranty. Most deals will typically include multiple survival periods, including a shorter period for breaches of general representations, with longer periods for claims arising out of breaches of fundamental representations (e.g., due formation, authorization, capitalization) and tax and environmental representations. Of the 142 asset purchase deals announced between January 1, 2016 and September 30, 2016 with indemnification provisions, 51, or 36%, had a single survival period for claims arising out of breaches of representations and warranties. For this set of deals with a single survival period, the minimum length was 159 days, the maximum was 730 days, the median was 270 days, and the mean was 284.56 days (approximately 10 months). For the same period, 87 transactions contained extended or unlimited survival periods for at least some representations and warranties. The most common extended representations are with respect to organization, authorization, and taxes (appearing in 90%, 92%, and 70% of transactions, respectively). When negotiating an indemnification provision, it is important to keep in mind that indemnification is designed to allocate risks between parties to a transaction. Therefore, it is essential to have a full understanding of the risks inherent in the assets or business being purchased in the transaction, whether you are representing the seller or the acquirer. Counsel should also weigh the potential magnitude of the risks to be indemnified versus the economics of the transaction, so that the scope of its client’s indemnification obligations is appropriate to the benefits to be conferred upon the parties in the deal. Typically, indemnification in M&A agreements covers losses resulting from breaches of representations and warranties and breaches of covenants. Depending on the nature of the assets or business being acquired, the parties may also agree to indemnification obligations for losses resulting from deal-specific liabilities. The purchase agreement should specify whether thirdparty claims are covered under the indemnification. As counsel, you should ensure that the right parties are subject to, and beneficiaries of, indemnification obligations. In an asset purchase transaction, the seller and acquirer typically indemnify each other for losses arising from the agreement. Each party may also add their directors, officers, employees, and other affiliates and subsidiaries as indemnified parties. The circumstances of the transaction may dictate that parties other than the seller and acquirer provide indemnification. For example, if the seller will liquidate and dissolve after the asset purchase, the acquirer may require the seller’s shareholders or other affiliated parties to provide indemnification for losses that might arise post-closing. In this circumstance, the seller will want to limit the number of parties obligated to indemnify the acquirer as well as the scope of the indemnification and the maximum potential liability. As discussed above, indemnification provisions often include baskets, deductibles, and caps to limit the overall amount for which the indemnifying party will be held liable. Survival periods also limit a party’s indemnification obligation by setting a time limit on when claims may be brought. Counsel should negotiate these limits with an understanding of the potential liabilities associated with the assets or business being purchased and the economic realities of the transaction for the seller and acquirer. With respect to survival periods, the length of time can vary depending on the nature of the claim. For example, claims arising out of contract breaches can have a shorter survival period than environmental liabilities, which may not manifest for many years. Counsel should also take into account the statutes of limitations for various types of claims when determining the appropriate length of indemnification obligations. The purchase agreement should set forth the procedures for asserting an indemnification claim. If part of the purchase price will be set aside in escrow, the purchase agreement should specify whether the escrow covers indemnification claims. If so, the agreement should include procedures for satisfying indemnified claims out of the escrow account (or refer to the escrow agreement for such procedures). The purchase agreement should also include provisions for resolving disputes relating to indemnification— whether such disputes will be resolved through litigation or alternative dispute resolution. 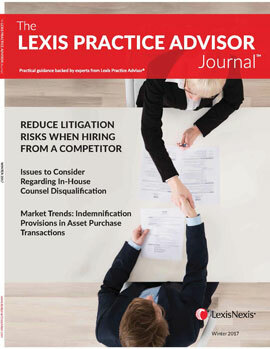 *The analyses in this article were generated by Lexis® Market Tracker, https://lexismarkettracker.lexisnexis.com/, which is a transactional search tool that enables users to find and compare M&A transactions across hundreds of deal points. The Lexis® Market Tracker database is populated by filings from EDGAR and includes asset acquisitions valued at $100 million and up. Accordingly, transactions not filed on EDGAR and transactions valued at under $100 million are excluded from this analysis.